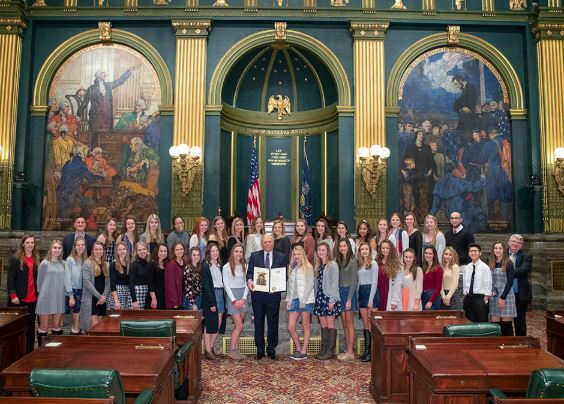 It was a pleasure to join Representative Marcy Toepel (R-147) in welcoming the Souderton Area High School Girls’ Soccer Team to the Senate and recognizing them for winning the 2018 PIAA State Class 4A Girls’ Soccer Championship. They won the state title by defeating Pennridge High School 1-0 in overtime. It was my honor to recognize the coaches and assistant coaches for their leadership, and commend team members for their outstanding performance and commitment to excellence. The Governor’s budget proposal includes a $927.3 million (2.8 percent) increase in state spending from the current fiscal year. I’m pleased that Governor Wolf is not requesting any broad-based tax increases for Pennsylvanians. We need to continue focusing on ways to improve the efficiency of our government. We have begun to implement performance-based budgeting measures though legislation I authored, Act 48 of 2017, and these measures go beyond simply setting spending levels. Instead, it develops measures to grade the outcomes of expenditures for state agencies and tax credit programs. With such measurements, we can eliminate unnecessary spending and adjust programs to achieve their stated purpose. I look forward to utilizing these performance measures and working with the state departments during the budget hearings. A measure I co-sponsored to strip taxpayer-funded pensions from public employees who commit job-related felonies was approved on Monday by the Senate.